As compact pickups have disappeared from the new truck marketplace, and existing ones have disappeared via attrition, it’s interesting to see how many with good provenance (yes, that’s a silly term at this end of the scale) are showing up for sale. Often, these survivors have low miles, single family ownership, or long-term storage in their histories, so while you may need to put some effort in, you’ll get to experience what the buyer of a 5-10 year old compact truck did. 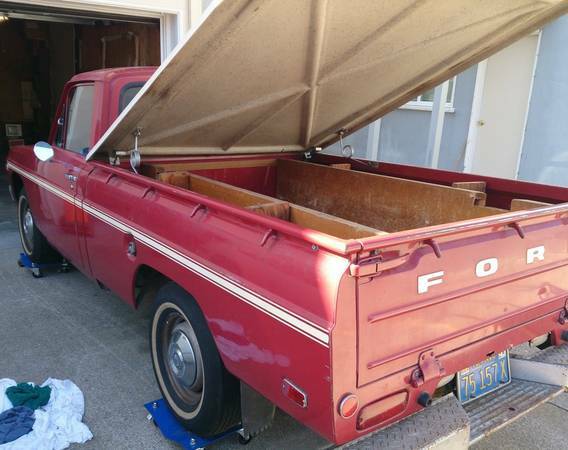 Check out this 1974 Ford Courier, for sale for $3000 in Daly City, CA. Primary colors are great for these small trucks. With this one at 89,000 miles, your experience will mirror what someone would have found in 1981, were they shopping for a ’74 Courier. Well, except they didn’t find it online or call the seller on a cell phone. It looks to be in perfect as-found condition in the pictures, with a light layer of dust that reflects the gentle indoor storage since 1985, and appears to be very complete, down to the dog dish hubcaps and white body stripes. The bed with cover and compartmentalized sections is interesting, though depending on your plans, it might reduce its usability. 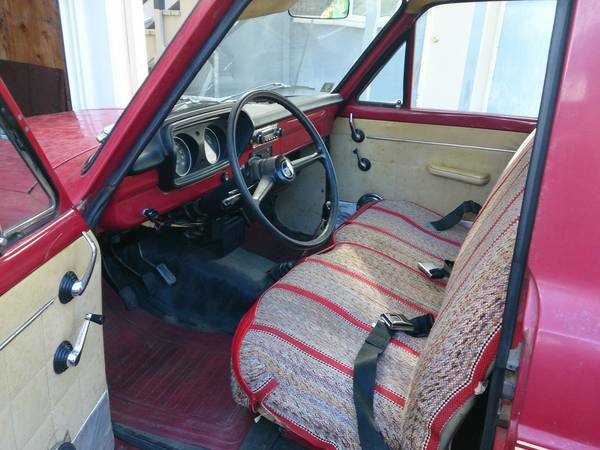 The interior looks tidy and complete, and while the bench seat has a Mexican-blanket style cover on it, you can see the flesh-toned upholstery poking out on the sides, so hopefully there are intact seating surfaces underneath. The only concerns are the cut door panels – the show judges will be horrified – and a missing auxiliary gauge below the radio. Other than that, it looks ready to go. Unfortunately, there are no better images of the exterior, but the detail shots of individual areas of the body all look good and point to a rust-free shell. 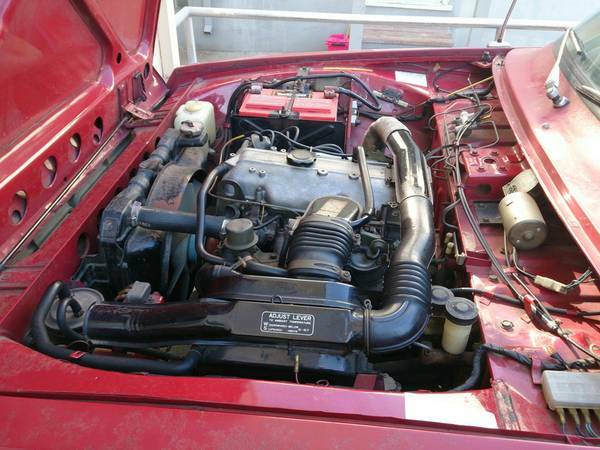 The engine compartment looks very clean for a truck used for the first 11 years of its life, but will of course need replacement of all consumables, rubber and liquid. With a 4-speed transmission, you’ll be able to make the most of what little power it does offer. No indication is given of the state of the engine, even to say whether it turns, but given the gentle storage, there’s good hope. This entry was posted on May 22, 2014 at 10:38 am and is filed under Feature. You can follow any responses to this entry through the RSS 2.0 feed. You can leave a response, or trackback from your own site. I haven’t seen a Ford Courier since the 80’s. There’s a couple of rusty Chevy Luv’s tootling around here which always amazes me. This is cool and I like it but I have my doubts there’s $3,000 waiting in someone’s pocket for it; especially when it’ll take a $1,000 or so to re-commission it. That begs the question, would someone pay $4K-ish for a nice, recommissioned Courier? I’m sure some good negotiation could get a few hundred bucks off the price… for some reason I looked at other running examples online that are not as nice cosmetically, and they are around $1500.